Hello! Have you started to get your Fall decorations out yet? I've brought a few boxes of orange things up from the basement, and it's really gotten me mentally ready for the crisp air, crunchy leaves, and shorter days. 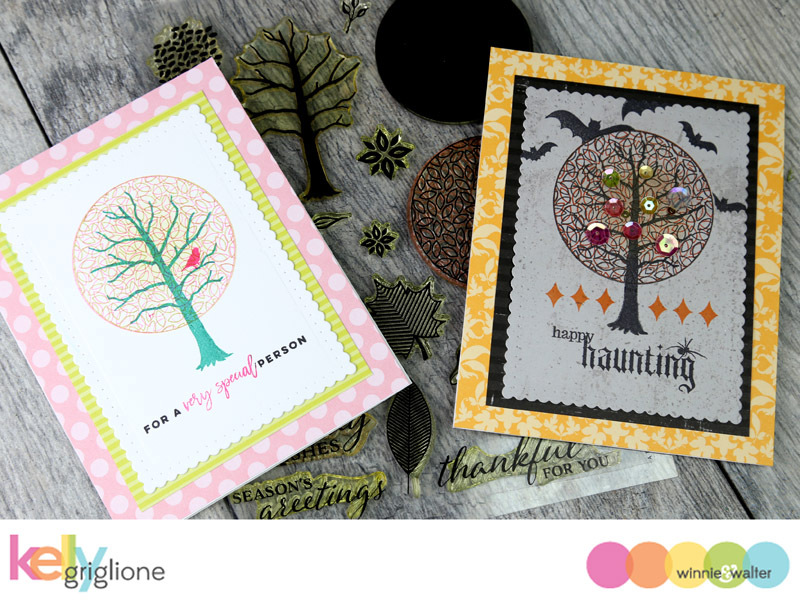 And also for making cozy fall cards, with lots of warm colors! 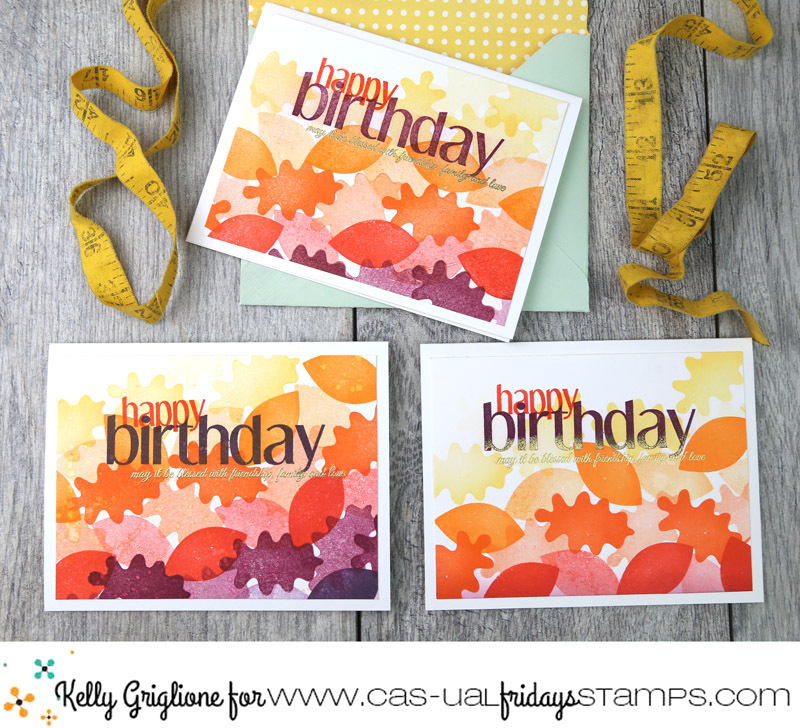 These cards use my favorite Shenanigans set for the big sentiment and Amber Waves for the smaller script sentiment. Autumn Blessings is responsible for all the falling leaves in the pile. Hi Folks! Are you ready for some serious color? 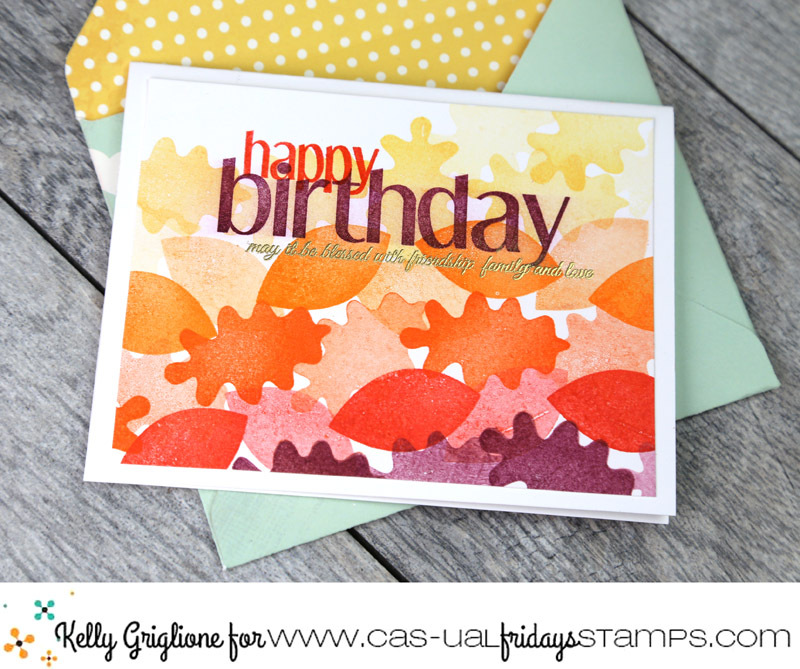 I've been playing with the new In a Word: Birthday Tiles Cutaways and have a few cards on the Winnie & Walter blog today if you want to check them out! Hi Folks! 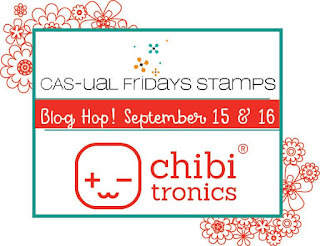 Welcome to the Chibitronics and CAS-ual Fridays Stamps Blog Hop! You may have come from the lovely Lisa Lahiff, but if not feel free to start at the beginning with Chibitronics. 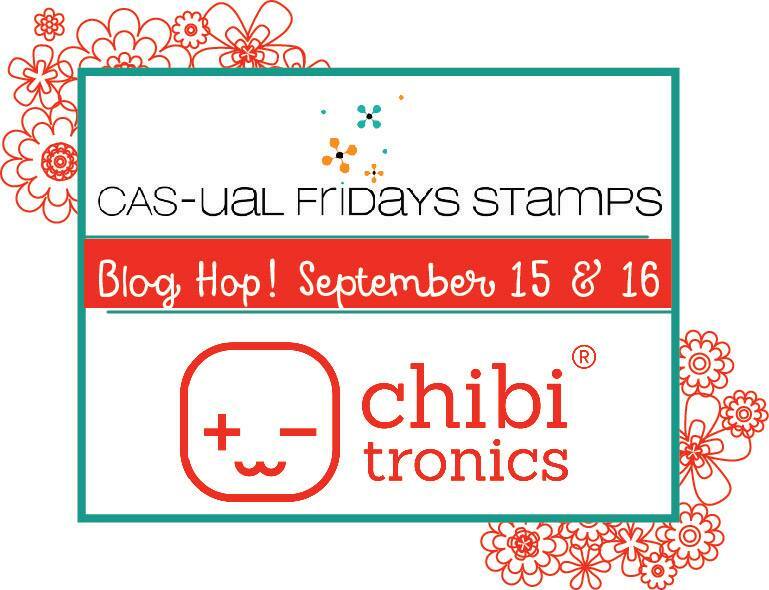 Along with tons of inspiration lighting up the CAS-ual Fridays stamps with Chibitronics lights, we’ll be giving away a Chibitronics starter kit and a CAS-ual Friday Stamps $30 gift card to one lucky commenter. Hooray! 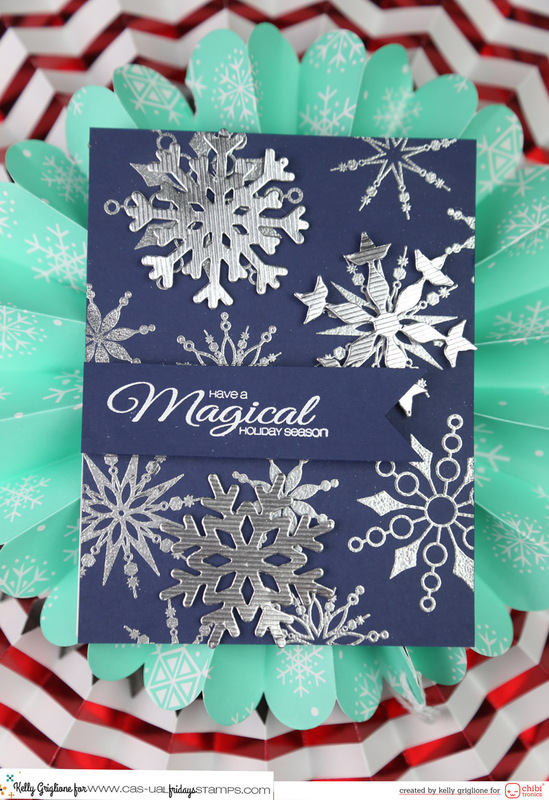 Today's winter wonderland card uses a card base that's been embossed in silver with Bring on the Snowflakes, silver snowflakes cut with Flurry FriDies, and a sentiment from Snowy Sayings embossed in white on a banner (which are all three on SALE). For the lighted effects, I've used the LED light stickers and copper tape from Chibitronics, as well as a CR2032 battery that I was lucky enough to find at our local flea market in a pack of 5 for $1, but you can also get them on Amazon here. The first thing you need to figure out when adding these amazing lights to your projects is where to put the battery, because that is what is going to add height to your project. 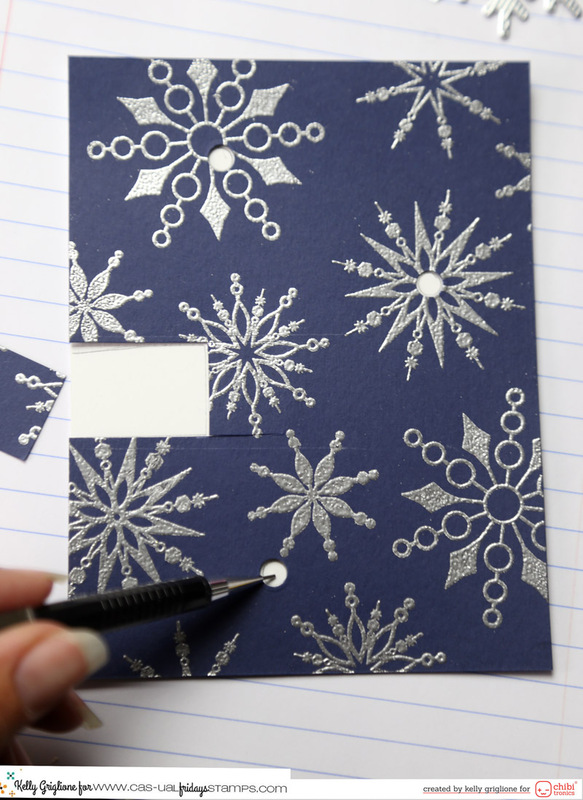 Typically, you'd have a shaker-type card where an entire raised panel covers the card and battery, but for this card I wanted the card to be flat except for each snowflake, so I'm hiding the battery under the sentiment banner. 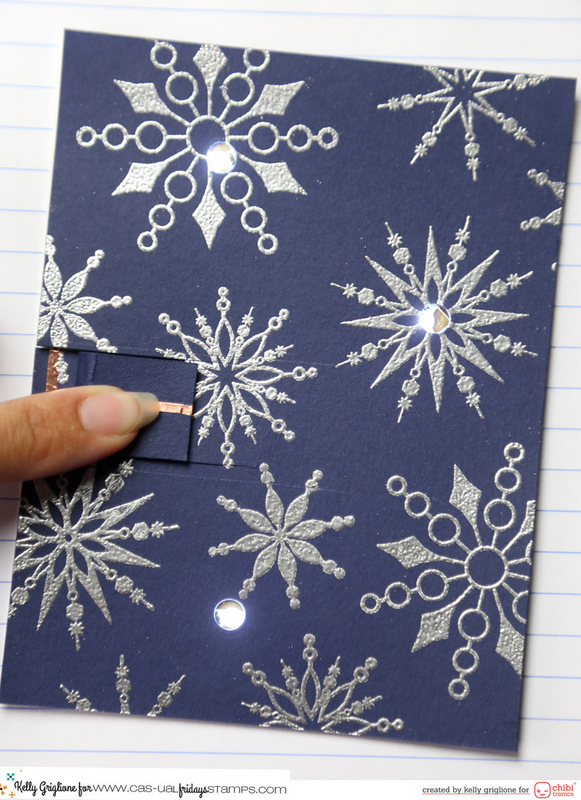 I cut a notch out of the left side of the card for the battery (see next photo) so the copper tape that will power the lights can go underneath my snowflake panel. I also punched a hole where I want the center of each snowflake to go so the light can shine through and illuminate it from behind. I marked each hole in pencil on the white card base below so I'll know exactly where to put my lights. 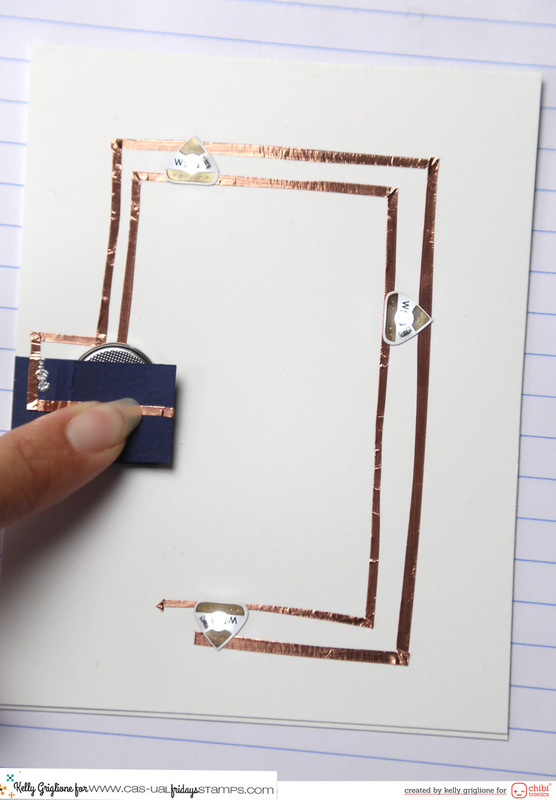 Now it's time to make the path in copper tape that will make the circuit to turn on the lights. 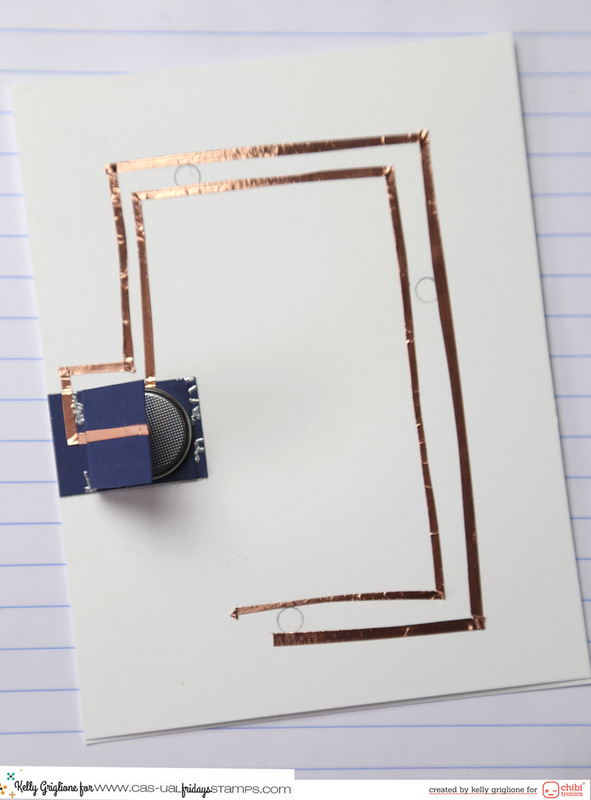 On this card, the bottom side of the battery is the positive charge and the inside track of copper tape, and the top side of the battery is the negative charge and the outer track of tape. 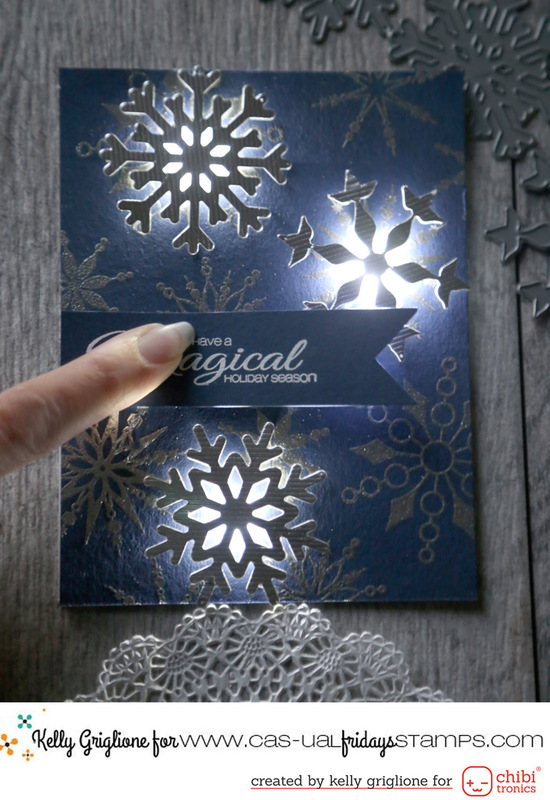 I've run the tape to go around each of the three circles I traced earlier so the lights will line up exactly with the holes in my snowflake panel. I placed the LED lights on top of the circles, so the wider positive side is on top of the positive track and the narrow negative side of the LED is on top of the negative track. Then my favorite part is pressing the tape on the battery to see it light up. I AM ALWAYS AMAZED! It's the best feeling, really. 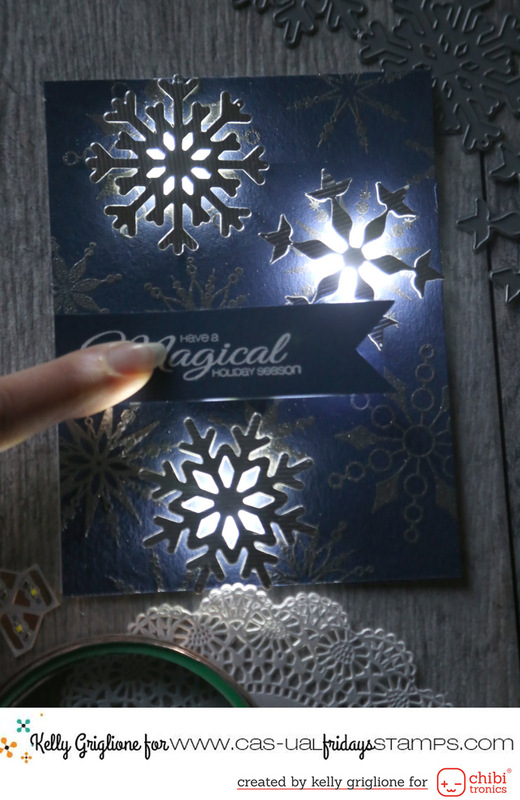 Now, thanks to careful planning, the lights shine through each of the three holes where I'm going to put the silver snowflake dies. The snowflake panel is now hiding all the tape. I'll need to add the sentiment banner on top of the battery with foam tape, and add the snowflakes with foam tape as well. Here's the card at night! The glow from behind the snowflake dies is exactly what I was hoping for, and reminds me of chunky flakes falling down in front of the street light outside our house at night. 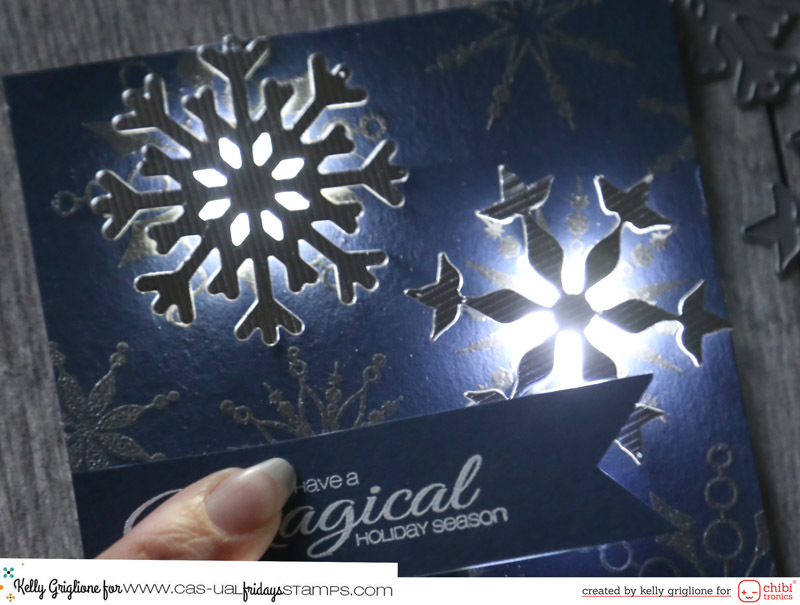 An added benefit is that the lights also illuminate the silver embossing, making the stamped snowflakes shine too. I just honestly love working with the Chibitronics lights, and always feel proud of myself after showing my family the finished card. The looks on their faces the first time they light it up are so rewarding! 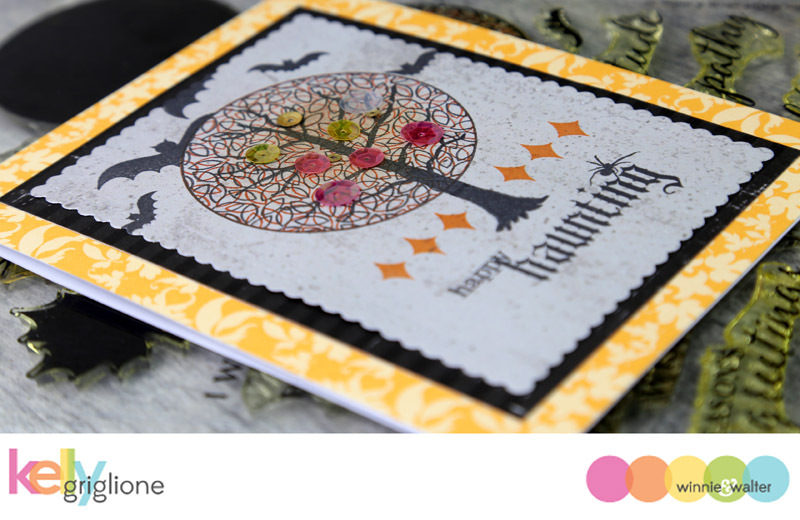 Your next stop is Jeanne Jachna who always has something fun and clever to share with us! Sure hope you're having a fun time hopping! Kelly Griglione - you are here! Hello Folks! Who doesn't love a good sale? Being as it's almost time to start thinking about holiday cards, CASual Fridays has just dumped a ton of their Christmas, holiday and winter sets in the SALE section. Not only that, but you can combine these sale prices with our sale code KELLY2017 to get an additional 15% off! Sweet! To celebrate, we're hosting three days of card reveals at the CASual Fridays blog using the sets that are now on sale. This one could not be easier to make, and you could really pick any sentiment to feature. 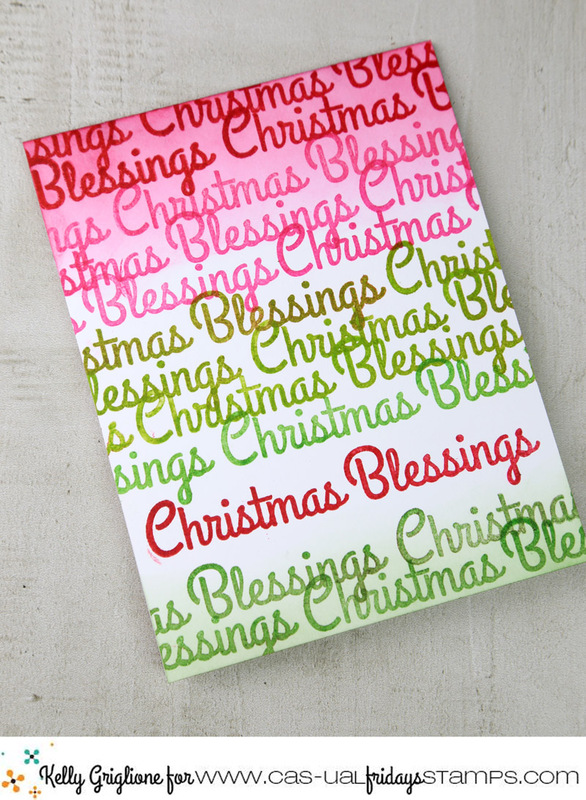 This particular sentiment "Christmas Blessings" from Lovely Blessings worked well because it spans perfectly across the card, as you can see from the lower red focal sentiment that has the white space around it. Some ink blending on the top and bottom, and that's it. You could use this idea for any holiday or occasion. 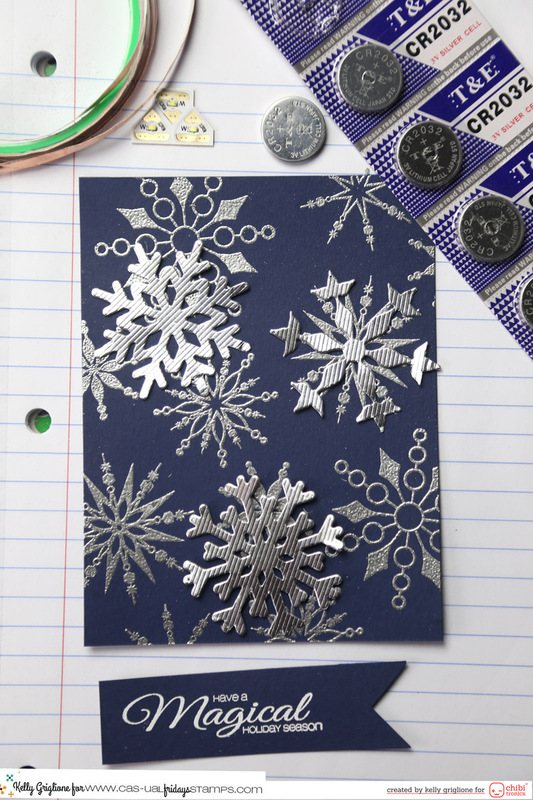 These snowflake dies from Flurry have always been a favorite because you can use them on anything. 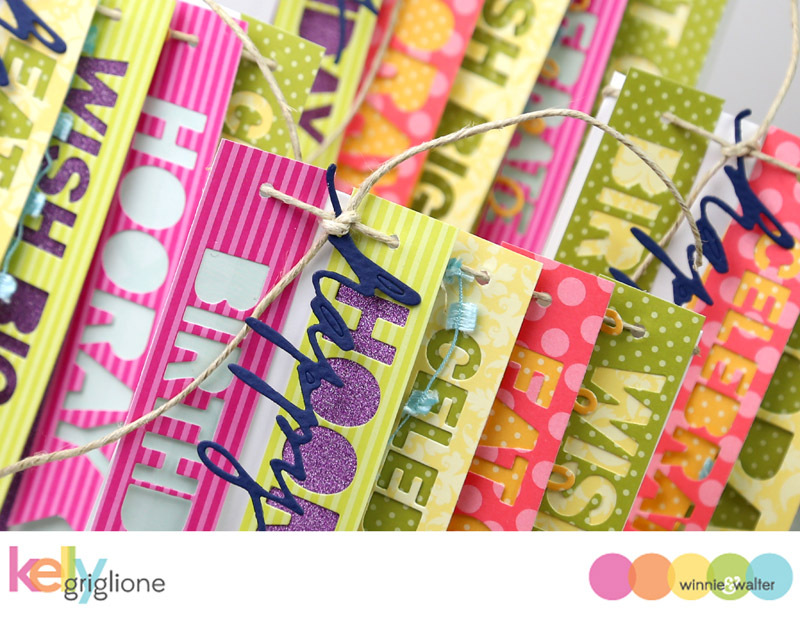 They're great as an embellishment, or to cover your entire card like this one. So simple! 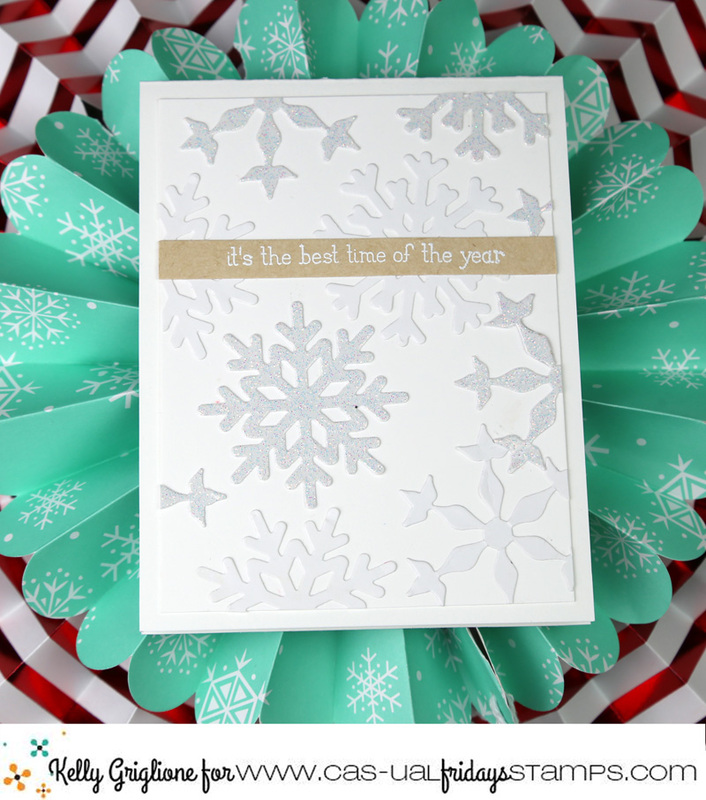 The white on kraft sentiment is partially stamped from Holly Jolly borders. 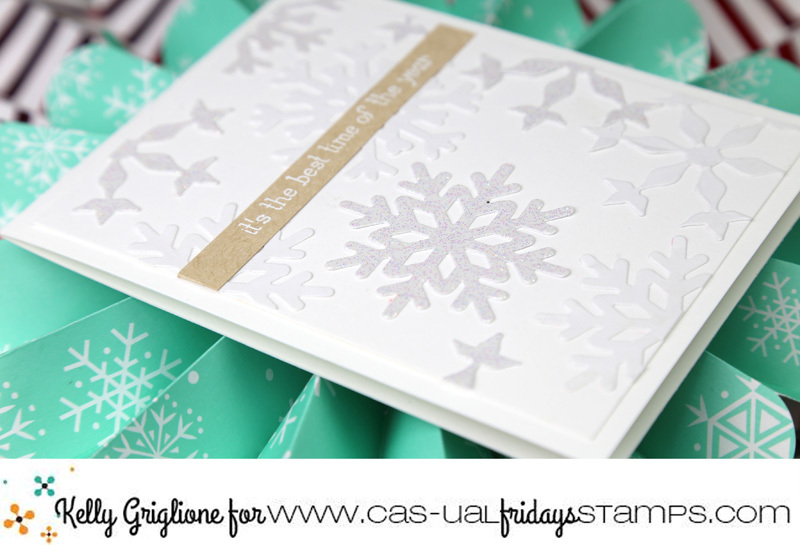 Originally I stamped the sentiment in black, but when I thought about it more, white goes so much better on a snowflake themed card. 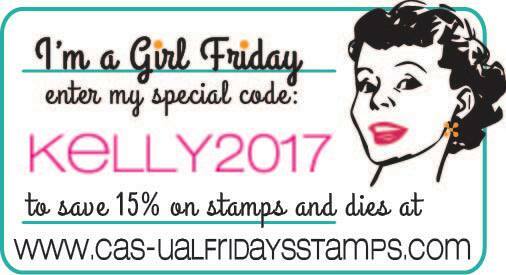 Hope you can take advantage of the sales and the KELLY2017 discount code to get a jump start on your holiday crafting! Hi Folks! Another month starts another rerun feature at Winnie & Walter! This month we're dusting off the Tree for All Seasons set. I hadn't used the circle filled with leaves yet, so was happy to play around with this design for two different cards. First up is a Spring card with pink. lime and aqua. 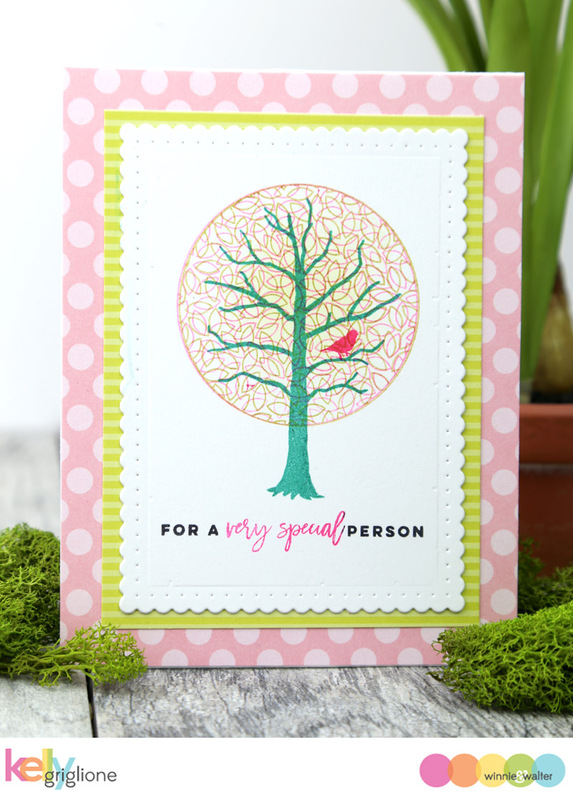 I stamped the leaf circle in pink, rotated it slightly, and stamped again in lime to get a fuller tree with the different colors. I like having the script part of the sentiment be in a different color than the rest of the sentiment, and after stamping that, thought it would be perfect to stamp a single bird in that same color to go along with the "special person" sentiment. The sentiment is from the new Sentimental: Gift which is free with qualifying orders through September 15th, and the panel is my long time favorite from Essentials: Audrey Cutaways. 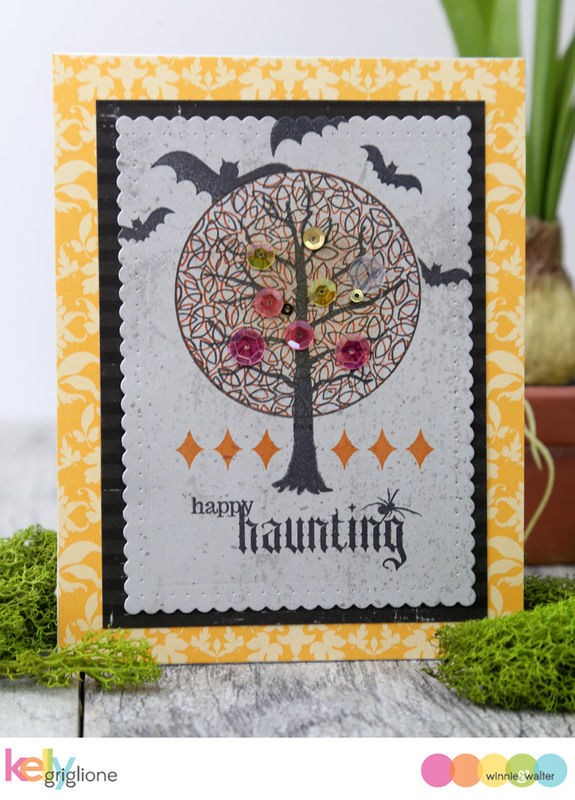 This card has the same tree, with the same rotating and double stamping of the leaves, but instead of Spring it's Halloween with orange and black for the leaves. The spooky accessories come from Moonlight, an essential Halloween set. My favorite is the spider hanging out on the "g."
A few sequins and bats never hurt anything either! The tree looks equally at home as a Spring tree or a spooky Halloween tree depending on your color and accessory choices. Head on over to the Winnie & Walter blog to find out details on how to participate in the rerun challenge, which is open throughout the month. Don't forget there is also a giveaway, AND the featured set is on sale. Hi Folks! 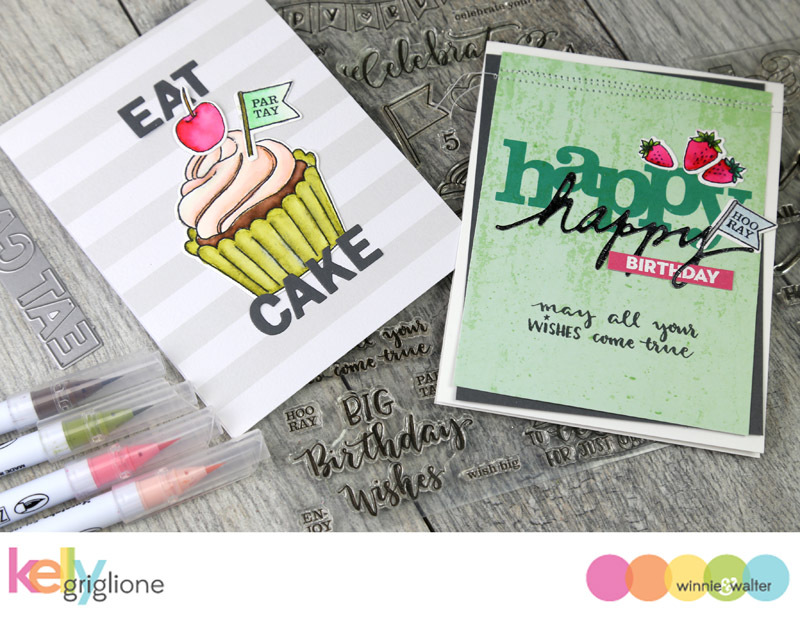 Winnie & Walter's Wish Big with Evelin T Designs set is my absolute FAVORITE set of the new release! I love, love, love it. 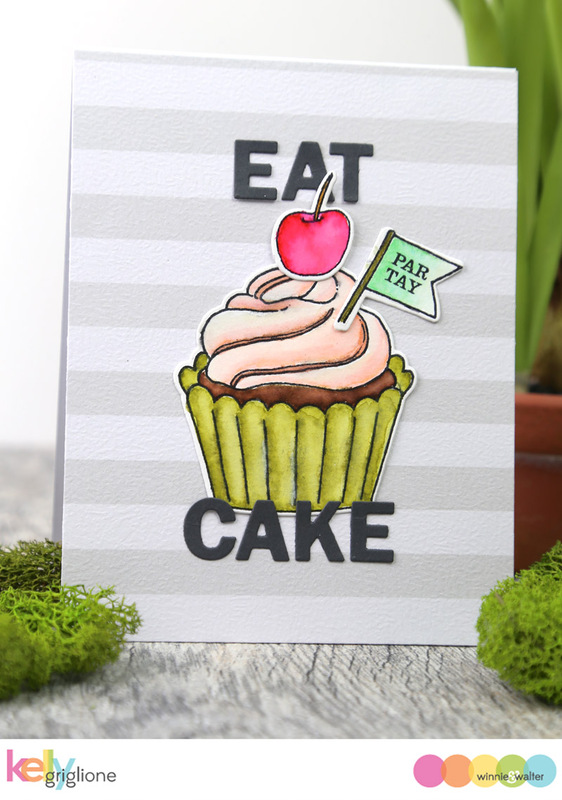 There are so many wonderful birthday sentiments for inside your cards (always a neglected space, I feel), tiny secondary sentiments to add places, cute flags and accessories, tiny numbers, a banner, and one giant, delicious cupcake. Really, what more could you ask for in a birthday set?! Wish Big is my favorite set, and this is probably my favorite card of the release. 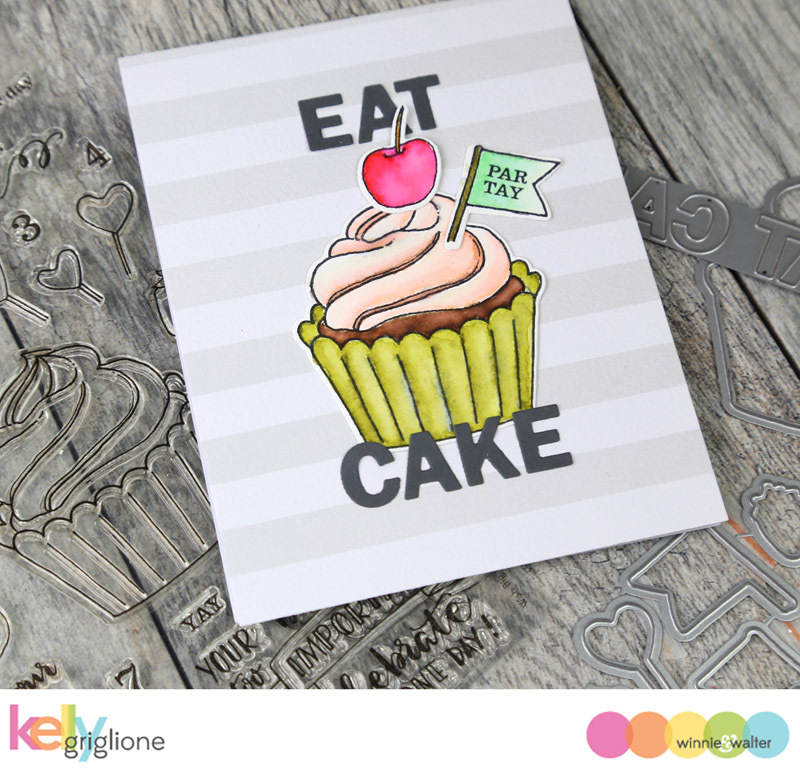 That cupcake, along with the coordinating cutaways, is the perfect size to carry a card by itself. And then you have all the fun accessories to trick it out ... a cherry and the adorable flag with the cute split sentiment are used here, but I also could have chosen strawberries, or hearts on a stick, and instead of the sentiment I could have stamped the age of the birthday recipient. So many choices will lead to so much use over the years. And then can we talk about the EAT. CAKE. ? Love those instructions!! Well, yes, fine, only if you insist. Hahaha! 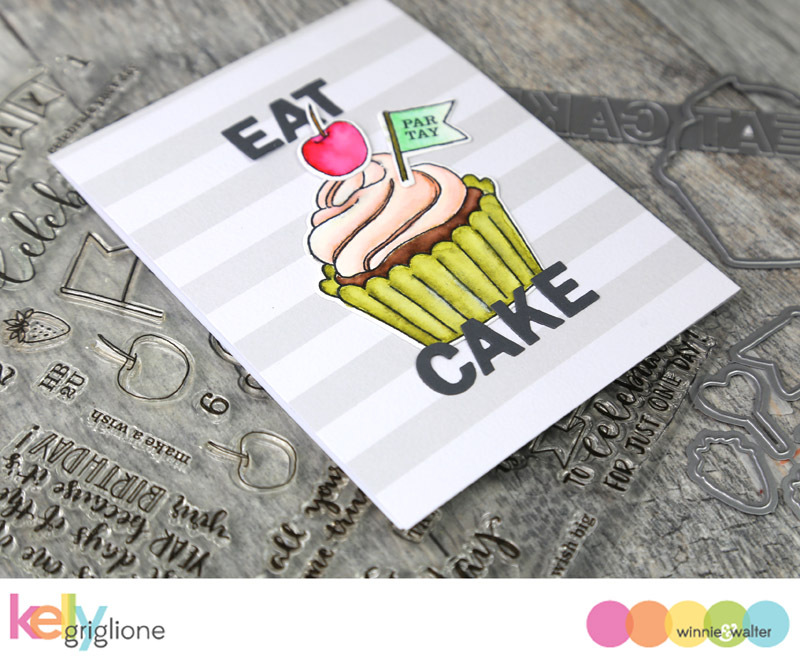 These cutaways are from the previously shown Birthday Tiles set. Having the words already laid out for you makes it so easy to get the spacing right. Just use the negative die cut piece and adhere the letters in the spaces. After cutting all the accessories, I was left with these three cute strawberries and I knew I had to make a card with them instead of setting them aside for "later". Good thing, because I really like how this one turned out too. 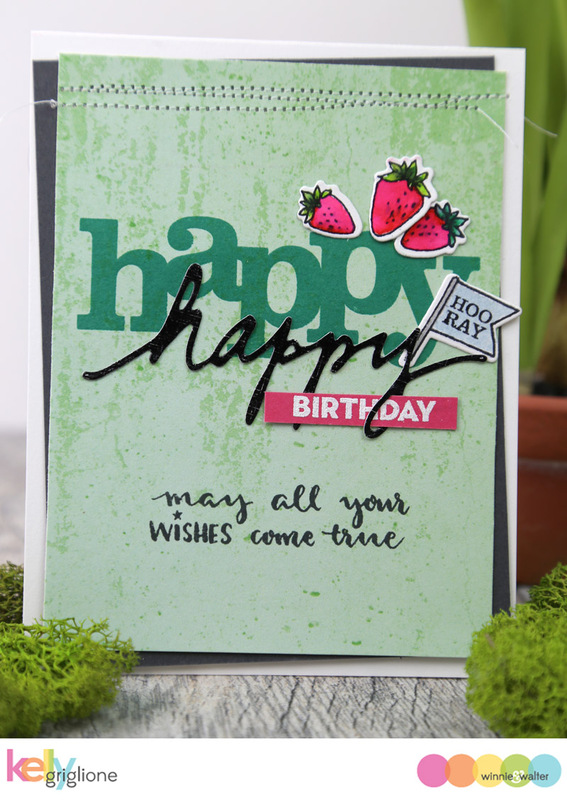 I layered a "happy" cutaway on top of a bold "happy" stamp, also shown earlier this week, and threaded the "birthday" through the "y" loop to tie it all together. 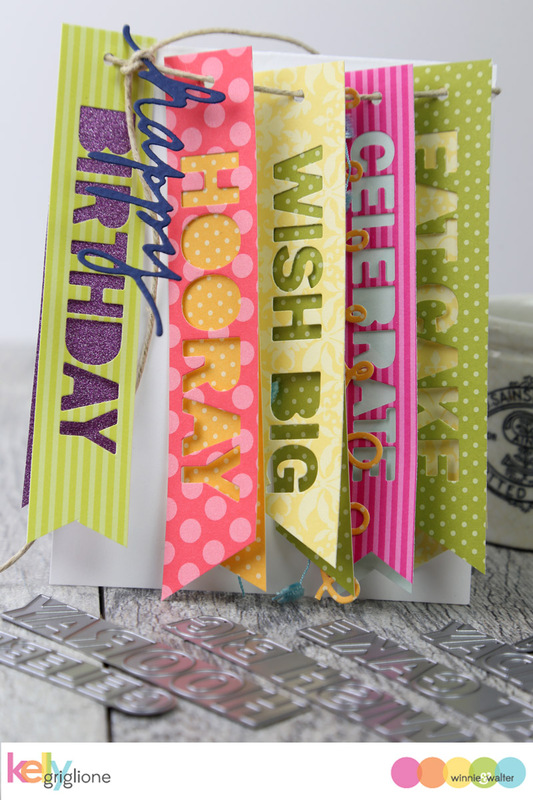 Not wanting to waste the extra flag that was cut out, I added a tiny sentiment and stuck it behind the "happy." I love having a secondary sentiment to add on the bottom of the card. I think it balances the card out from a design perspective, and it also adds more well for the recipient. Then I sewed the two panels on to the base of the card. Somehow, thread and strawberries always seem to go well together! Super love this stamp set, and hopefully you do too because I'll be using it quite often in the future! Thanks so much for checking out the new release this week! Stop by Winnie & Walter if you're interested in picking up any of these new goodies!